Friday is the last Bureau of Labor Statistics (BLS) Jobs Report before the final meeting of the year for the Federal Open Market Committee (FOMC) meeting. The FOMC has a dual mandate to pursue both maximum employment as well as stable inflation around their 2 percent target. Current forecasts signal that it’s more likely than not that the FOMC will raise interest rates in their December meeting, on pace with their behavior this year so far. However, the data, should give them pause to hold off and let the economy continue to recover—and the data they should really be paying attention to comes from the labor market, not the stock market. While the economy is experiencing continued low unemployment, there’s other evidence to suggest that recent levels of unemployment are overstating the strength of the economy. The share of the population with a job continues to be softer than recent labor market peaks. The figure below shows the share of the 25–54 year old population with a job, removing any issues of a shrinking labor force due to retiring baby boomers. 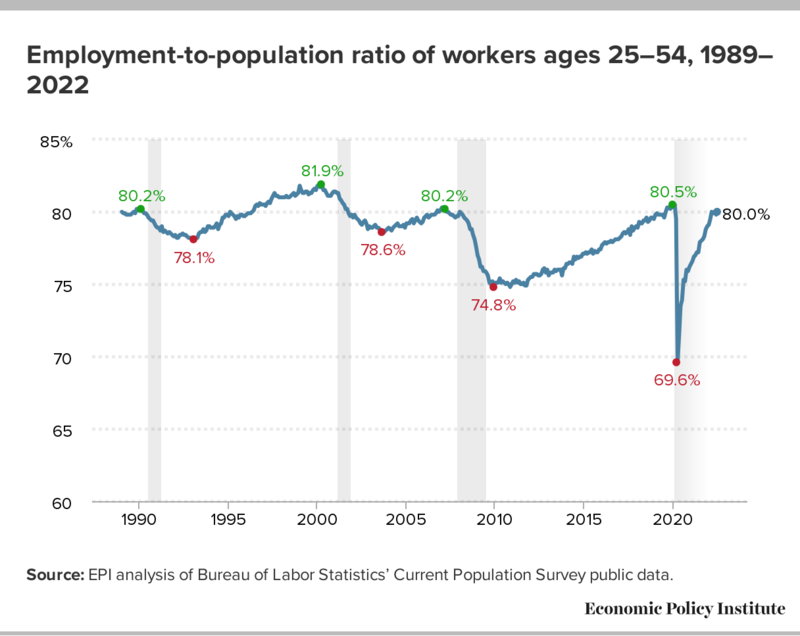 This prime-age employment-to-population ratio most recently came in at 79.7 percent, a huge improvement since the depths of the aftermath of the Great Recession, but still more than 2 percentage points lower than when the economy was closest to full employment back in 2000. As the economy continued to improve, not only did unemployment fall precipitously, but the share of workers (re)entering the labor force continued to rise. As it turns out (and what we’ve long argued), workers have not been permanently sidelined from the Great Recession, but have systematically been returning to the labor market in search of opportunities. Over the last few years, the newly employed have been coming both from the ranks of the unemployed as well as from outside the labor force, those who were not actively seeking work the month prior to finding a job. In fact, the share of newly employed workers who did not look for work the previous month is at a historic high. Over 7-in-10 newly employed workers are coming from out of the labor force. 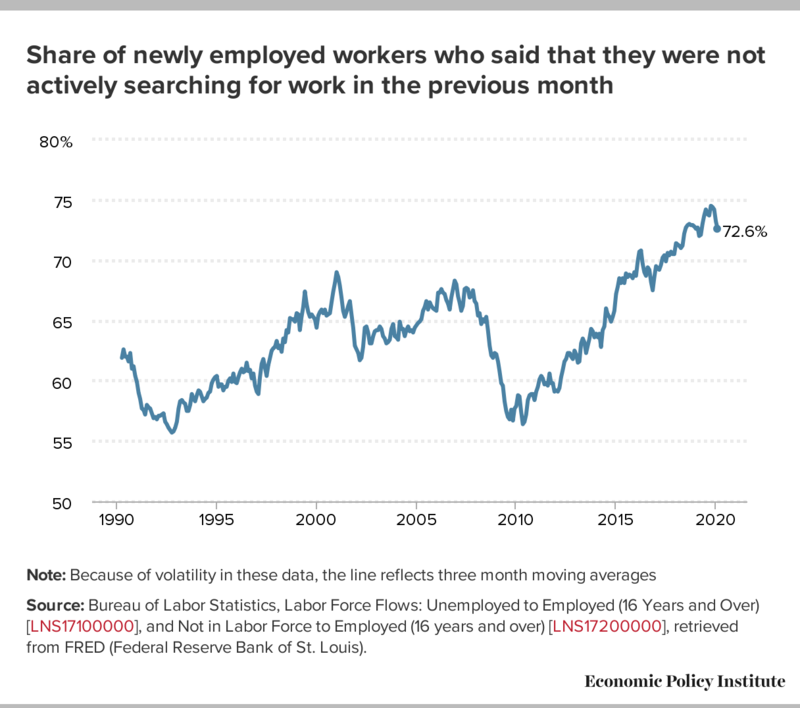 Clearly, these sidelined workers wanted jobs, yet another indication that the unemployment rate is understating the extent of slack or job searchers compared to previous periods. Source: Bureau of Labor Statistics, Labor Force Flows: Unemployed to Employed (16 Years and Over) [LNS17100000], and Not in Labor Force to Employed (16 years and over) [LNS17200000], retrieved from FRED (Federal Reserve Bank of St. Louis). The lack of strong wage growth remains one of the clearest indications that the economy remains short of full employment. 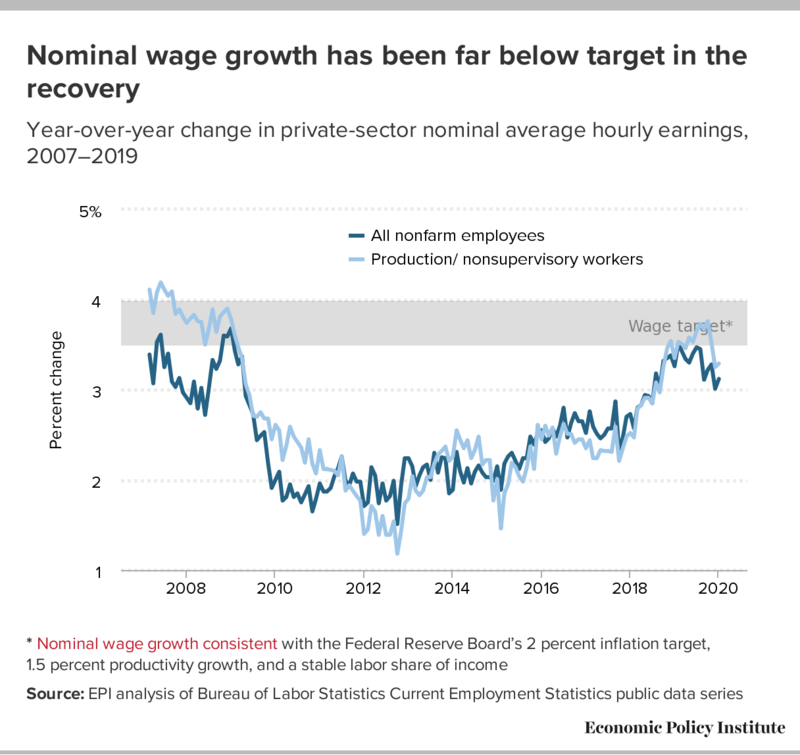 As shown below, nominal wage growth has shown some signs of life in the last couple of months, but year-over-year growth remains still below levels consistent with the Federal Reserve’s inflation target combined with long-term potential productivity growth, where it would be expected to be in a stronger economy. And, the Fed’s current path is intentionally keeping unemployment from dropping further and workers from getting any additional leverage to bid up their wages. My colleagues, Josh Bivens and Ben Zipperer, recently published a useful short study on the importance of locking in full employment for the long haul. The whole report is useful, but I’m stealing a chart (see below) because it demonstrates just how important full employment is for realizing strong and broadly based wage growth. The dark bars represent average annual real (inflation-adjusted) wage growth in the late 1990s, the last experience with a persistently tight labor market. As you can see, real wage growth was strong and broad. The light blue bars represent wage growth since 1979 over all other years (except the late 1990s). The average annual growth in all those years was zero or worse for middle-and low-wage workers. The case is clear. Reaching genuine full employment should be the main concern of the FOMC so that workers across the wage distribution—white and black, young and old—see the benefits of tight labor markets in their job prospects and wages. Note: Wage growth is inflation-adjusted.